Along Morocco’s Mediterranean coast, Spain has long maintained sovereignty over several small territories, described herein as “the enclaves”. 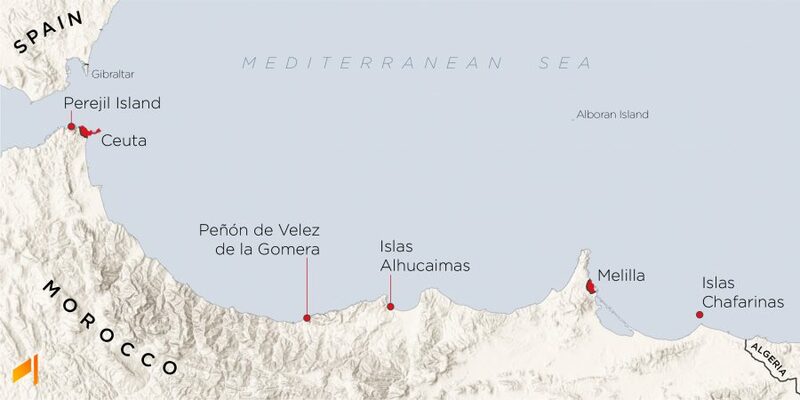 These are Perejil Island, Ceuta, Peñón de Velez de la Gomera, Islas Alhucaimas, Melilla, and Islas Chafarinas: collectively known as the Plazas de Soberanía. Three of these share land boundaries with Morocco, while the others are islands just off the coast. Despite their recognition of Morocco as an independent state in 1956 and the dissolving of the Spanish protectorate there, the enclaves have been sustained as territories of Spain and are administered as if part of it. Even so, Morocco has openly disputed Spanish ownership of the enclaves, and a 1975 straight baseline claim published by Morocco encompasses all of them. The western-most disputed feature, Perejil Island, is located just off of the Moroccan coast and is of note because it was the site of an armed incident between Spain and Morocco in 2002. Since 1977, Spain has claimed a twelve nautical mile territorial sea from the shores of its mainland and territories, however the state has made no explicit maritime claims relating to the enclaves on the African continent. 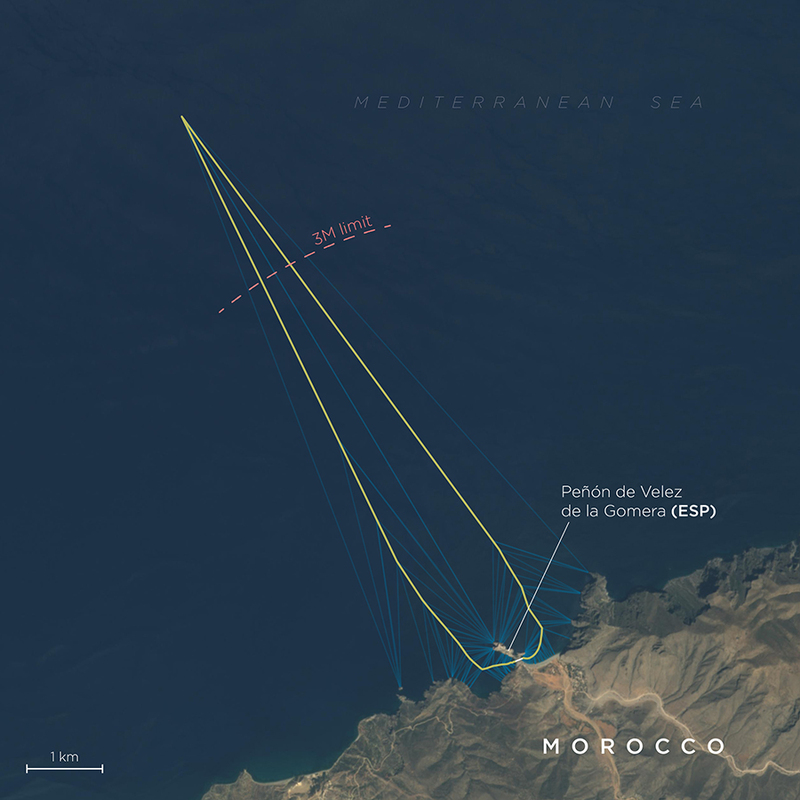 Given Morocco’s negative view on the Spanish possession and occupation of the enclaves, it is extremely unlikely that the two states would pursue any bilateral discussions on maritime space surrounding them. There is also little precedent for establishing maritime boundaries surrounding enclaved territories or possessions, especially the size of these. In the Mediterranean we could look to the island of Cyprus, where the United Kingdom claims a three nautical mile territorial sea from their sovereign base areas Akrotiri and Dhekelia, and a 1960 bilateral agreement established maritime boundaries with Cyprus following a path of simplified equidistance (of course, a key difference is that there is no dispute over the UK’s possession of these bases). We could also look to Monaco, which, from a 1984 agreement with France, gets a several-kilometer wide corridor out into the Mediterranean almost 50 nautical miles. However, Monaco is an independent, self-governing state and not a territory, so despite its size this example isn’t truly comparable either. Drawing comparison within the Mediterranean. 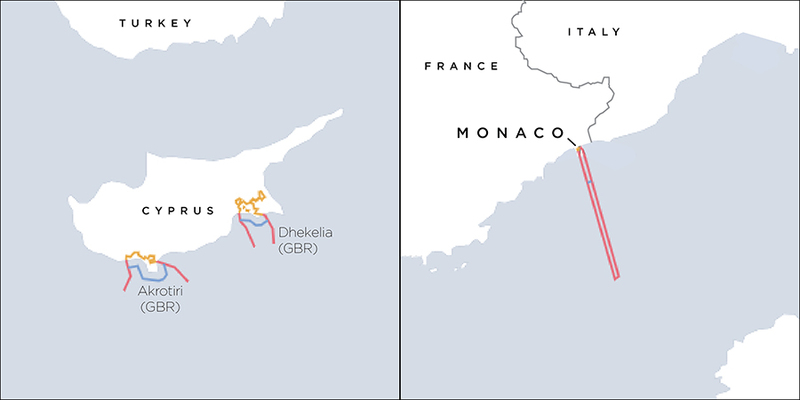 left) The United Kingdom’s established maritime boundaries with Cyprus for Akrotiri and Dhekelia. right) Monaco’s maritime boundary with France. 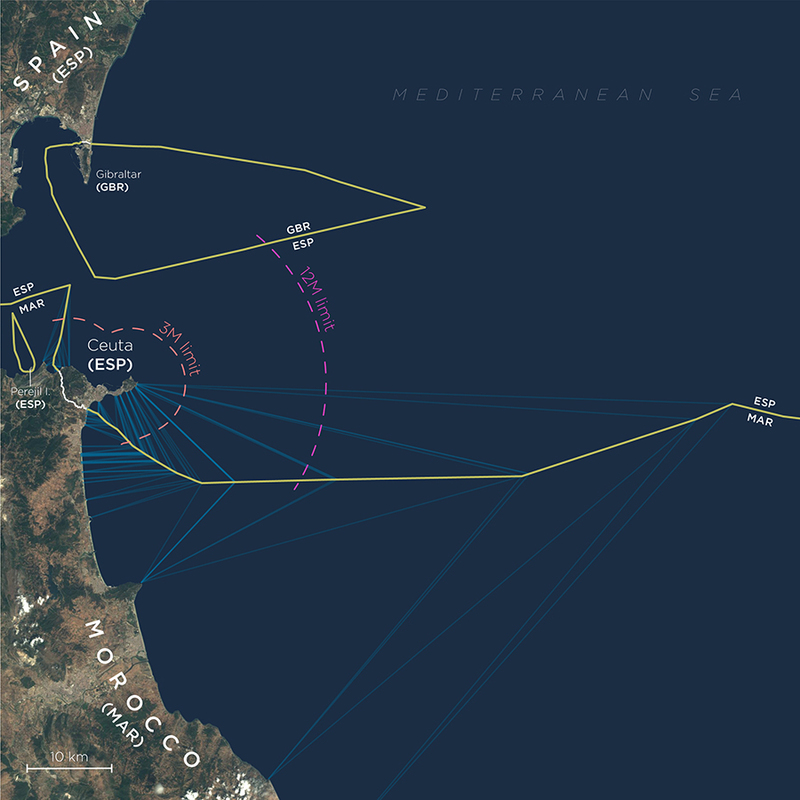 But, in the off chance that bilateral talks took place, what might maritime space around the Spanish enclaves look like? To begin to explore this question, I’ve plotted strict equidistance between the enclaves and Morocco, as well as potential territorial sea limits from each. These are explored in map form below, moving from West to East along the Moroccan mainland. 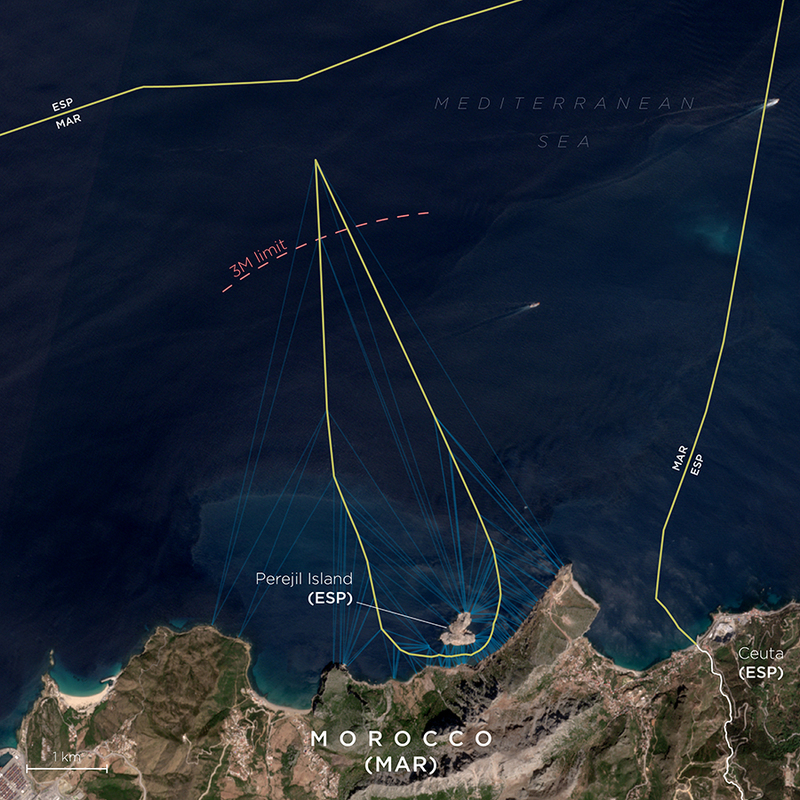 Equidistance between Perejil Island and Morocco closes in on itself fairly rapidly. This island was the site of an armed incident between Morocco and Spain in 2002. 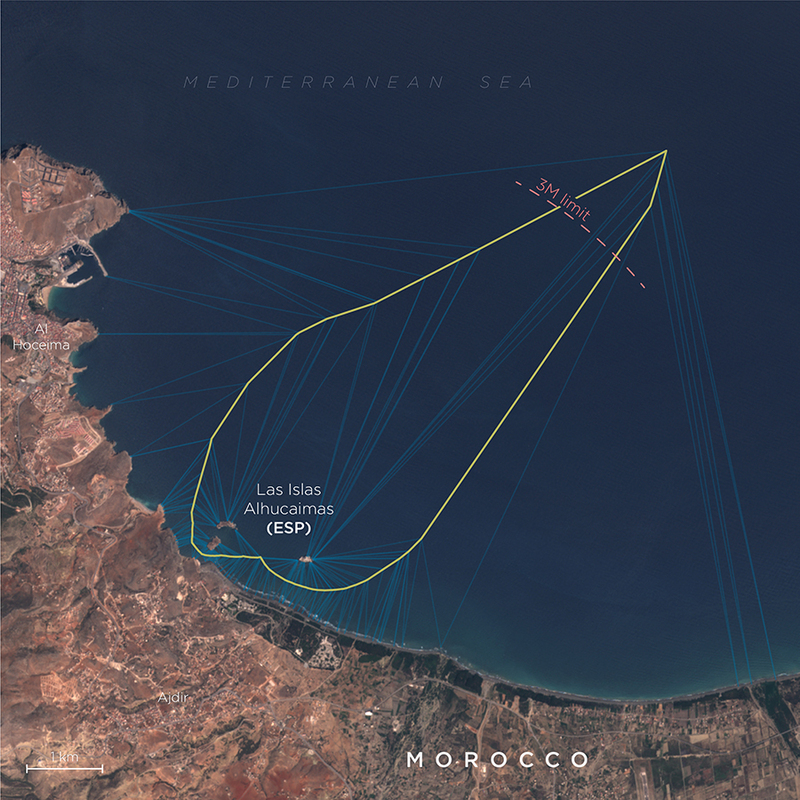 Due to its location at the mouth of the Mediterranean and proximity to Spain, equidistance between Ceuta and mainland Morocco would converge with equidistance between Morocco and the Spanish mainland, expanding Spain’s potential maritime Space near the Strait of Gibraltar. Equidistance lines quickly converge to cut off Peñón de Velez de la Gomera just over 4 nautical miles from the fort. Made up of islands Peñón de Alhucaimas. Isla de Tierra, and Isla del Mar, equidistance between Las Islas Alhucaimas and mainland Morocco also quickly closes in on itself. 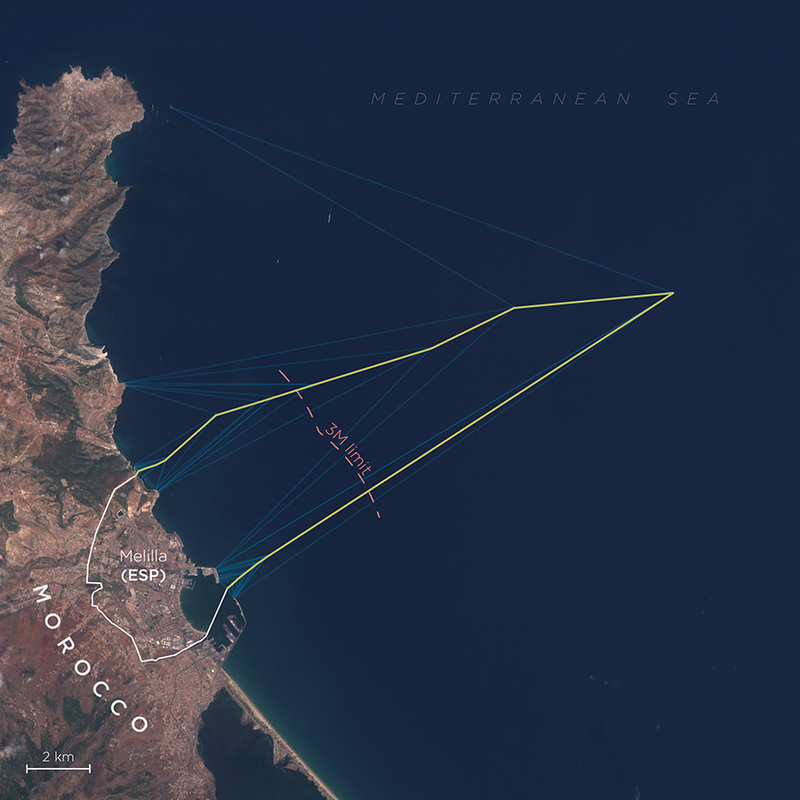 Melilla, similar to Ceuta in size and length of land boundary with Morocco, is cut off by equidistance with the Moroccan mainland just over 9 nautical miles from its coast. Las Islas Chafarinas (made up of Isla del Congreso, Isla Isabel II, and Isla del Rey) is the only other territory aside from Ceuta in which an equidistance line with mainland Morocco does not quickly close in on itself. In this scenario, the course of equidistance continues on in the direction indicated by the arrows to 1) intersect a provisional equidistance line between mainland Morocco and Algeria and 2) converge with an equidistance line between Morocco and the Spanish mainland to the North. 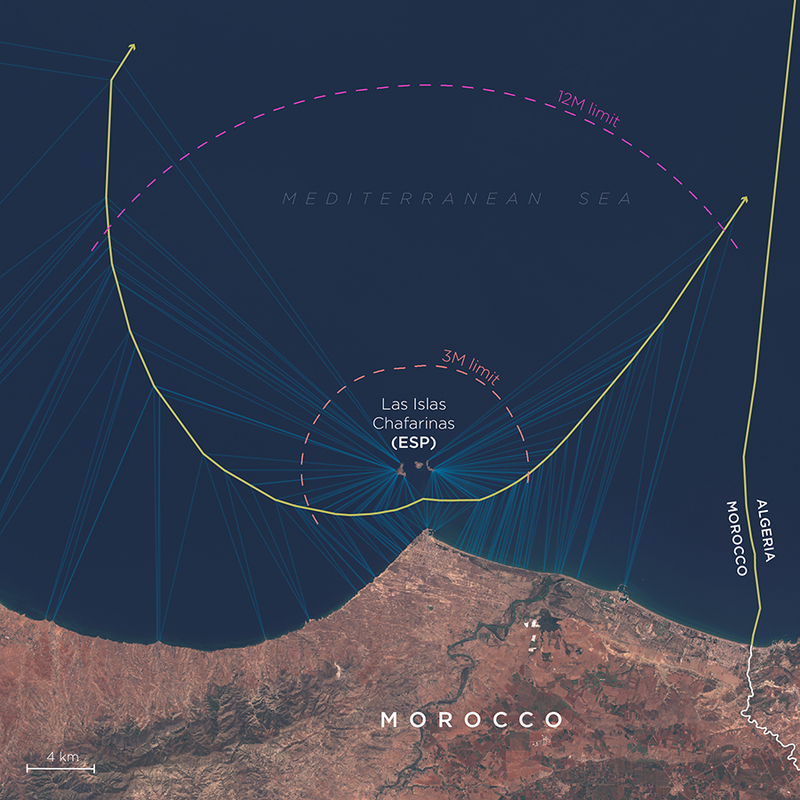 Given the proximity of Islas Chafarinas to the Moroccan mainland, it is highly unlikely they would be allowed a connection to the maritime space of mainland Spain, or to influence an Algeria-Morocco maritime boundary. So, above we see three and twelve nautical mile limits from the islands, which might cap off the islands’ potential maritime space (the Sovereign Limits database draws an implied maritime limit for Islas Chafarinas at the 12M limit, enclaving it). For the purposes of the Sovereign Limits database, we show disputes as they exist, acknowledging their presence but staying neutral to show a situation without taking one side or the other. We draw equidistance in maritime space using the principle that the land dominates the sea. This means equidistance lines are steered entirely by the configuration of the coast, and they begin from the point where a land boundary meets the shoreline. The Spanish enclaves are in one of the more unique categories of potential maritime disputes because they are enclaves. Morocco surrounds these areas entirely, which means if at some point Morocco gained possession of them, these invisible lines delineating borders and maritime space would disappear entirely. The history of some of the Plazas de Soberanía goes way back, and is quite interesting to read up on.